The new Rexroth VarioFlow plus chain conveyor system offers advancements in simplicity, flexibility, and quiet operation. VarioFlow plus is ideal for achieving a fast time-to-market. 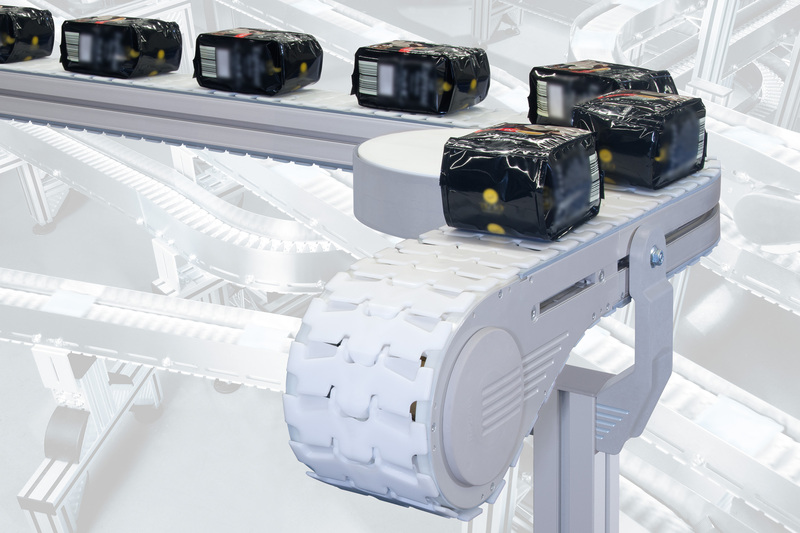 With the Rexroth chain conveyor system, users can easily configure individual, space-saving solutions for versatile, complex transportation tasks, even for particularly difficult environments. A number of standardized modules cover differing application requirements are available, all from stock and with maximum interchangeability and modularity. To simplify selection and correct combination of the modules, Rexroth offers MTpro planning software with Layout Designer. Conveyors and even complex multi-conveyor and workstation systems can be designed, components selected, and the results output to CAD. Even more valuable time can be saved during commissioning: the clever drive solution provides a great degree of planning freedom: the motor mounting position can be chosen on-site. This reduces the selection of drive variants to a minimum. With its low-noise operation, the new chain conveyor system contributes greatly to reduced noise and thus improved working conditions. Rexroth achieves this level of smooth operation through optimized sliding characteristics and the use of slide rails with lateral mounting. At the same time, this ensures low wear and fast, reliable assembly. The Rexroth VarioFlow plus chain conveyor system consists of components that can be used universally for all system widths, including the new track width of 120 mm. This reduces the need for spare parts for users. The stable chain permits tensile forces of up to 1,250 Newtons. The chain surface is nearly closed, allowing even the smallest of parts to be transported safely and reliably. The system offers individual conveyor layouts and comes in six sizes and two material options: a basic aluminum version and a stainless steel version for higher hygiene demands, for example in the food industry, where Rexroth uses components made of FDA-compliant materials. Alternatively, Rexroth offers a work piece pallet system suitable for transporting work piece pallets in the automotive and electronic industries. Economical, precise, safe, and energy efficient: drive and control technology from Bosch Rexroth moves machines and systems of any size. The company bundles global application experience in the market segments of Mobile Applications, Machinery Applications and Engineering, Factory Automation, and Renewable Energies to develop innovative components as well as tailored system solutions and services. Bosch Rexroth offers its customers hydraulics, electric drives and controls, gear technology, and linear motion and assembly technology all from one source. With locations in over 80 countries, roughly 36,700 associates generated sales revenue of approximately 5.7 billion euros in 2013. Digitalization is increasingly transforming mechanical engineering technologies. The Linear Motion Technology of the future will not only require mechanical performance data but also that engineers are increasingly able to integrate the data into their digital work flow and implement its application connectivity.